Bake pecans in a single layer in a shallow pan 4 to 5 minutes or until lightly toasted and fragrant, stirring halfway through. Coarsely chop pecans in a food processor and remove them to a small bowl. Add butter, flour, confectioner’s sugar, and salt to the food processor and combine until mixture is crumbly and beginning to turn into a ball. Save one-third of dough, wrap in plastic, and chill until ready to use. Press remaining dough on the bottom and up the sides of a 9-inch spring form pan or a pie pan. Cover and chill crust while preparing the filling. Toss together apples with remaining ingredients. Spoon mixture into prepared crust. 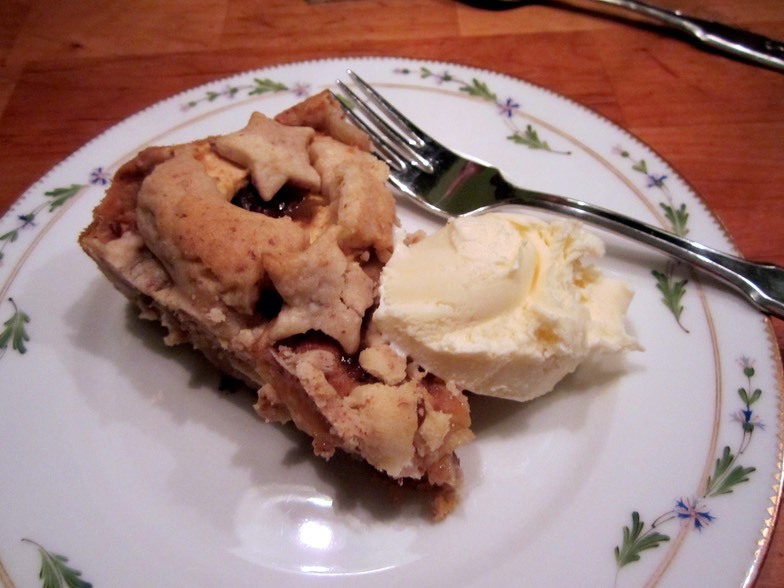 Use remaining dough to either cut in shapes or strips and arrange over apple filling. Bake at 350 degrees for 1 hour to 1 hour and 10 minutes or until juices are thick and bubbly, crust is golden brown, and apples are tender.